A man who was slashed with a knife and hit over the head with a laptop after an argument over a mobile phone said he frequently has "nightmares". Bedfordshire Police said Flavius Cristea became agitated after being asked to return the victim's phone and attacked the man with a kitchen knife. In a statement the victim thanked a witness who rang 999, saying "without them... maybe I would not be alive". 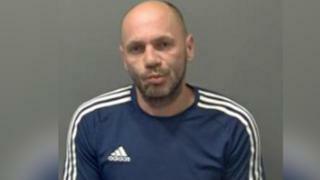 Cristea, 38, was handed a 15-month jail term at Luton Crown Court. The defendant, of Reginald Street, Luton, admitted causing actual bodily harm, making threats to kill and causing criminal damage, in relation to the attack at an address in the town on 28 June. Bedfordshire Police said Cristea grabbed a knife from the kitchen and used it to slash the victim's arms and press it against his chest and neck while threatening to kill him. A member of the public saw the attack through a window and called police who arrested Cristea, the force added. In a statement, the victim said: "I remember the incident clearly and I often have nightmares about what happened. As a result I cannot trust people, which makes it more difficult (for me) to make new friends now. "I would like to say thank you again to the person who called the police as without them doing this maybe I would not be alive today." PC Adam Hughes said: "This was an appalling attack which left a man with nasty injuries and in genuine fear for his life. "It was a violent assault which was only stopped by the arrival of police officers."